See full-sized image or accompanying article. Credit: Bill Marsh/New York Times. The only way we can make environmentally friendly changes is to be informed of the impacts those choices will have. 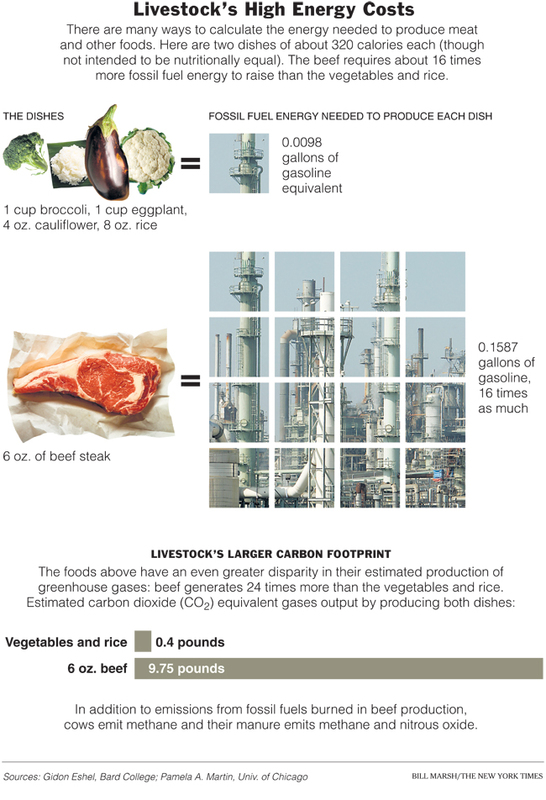 This thought-provoking article helps to show just how our food choices can drain resources and contribute to pollution in varying amounts. So if you’re thinking about purchasing a more fuel-efficient car or trying to think of what else you could do to help the planet, cutting back on meat is another option. In addition to the obvious health benefits and improvements in animal welfare, you can now add conservation of water, ameliorating climate change, and numerous other factors to reasons to reduce your consumption of meat.